While Maramureş is considered as rural Romania, it boasts a tourist attraction well-known throughout the country. Strange as it may sound, this star attraction is a cemetery. 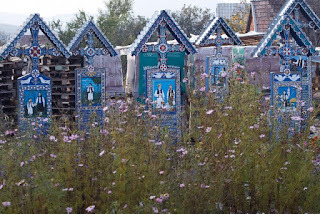 Merry Cemetery is situated in the village of Săpânţa, just kilometres south of Ukraine. Interestingly, this cemetery celebrates death with humour, and life with the simplicity of a single picture. Founded by a wood sculptor, who started carving wooden crosses for the tombstones in the old church cemetery in 1930s. 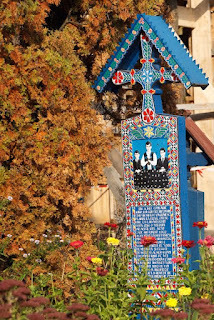 He painted them blue (the colour of hope of freedom) and inscribed humorous or witty epitaphs for the dead. The tradition was carried on by his apprentice, and now, there are hundreds of such crosses. 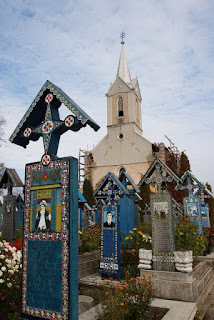 Unfortunately, I could not understand the Romanian epitaphs, and so could not appreciate the humour. 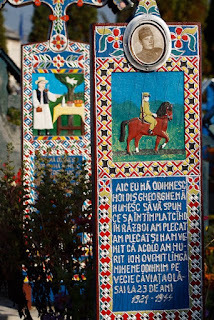 However, each tombstone is also painted a picture that depicts the life of the decreased, and wandering through the cemetery, you could almost imagine yourself walking through the traditional community of the past. 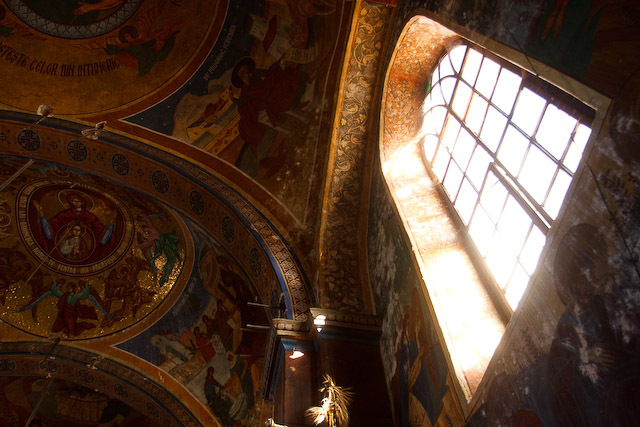 Besides the tombstones, the church in the cemetery have been refurbished, and the frescoes inside them are certainly worth seeing. We got to Săpânţa by a rented car, but if you are alone, there are buses to-and-fro from the nearest town Sighetu Marmaţiei. You may not feel "merry" visiting the cemetery, but I think it is still worth a visit!